Precise ignition timing is essential to produce maximum horsepower. However, one timing setting is not ideal for an engine's entire rpm range. The dynamics of air and fuel flow into the engine as well as the speed that the piston travels through the combustion stroke all affect the ideal timing setting. 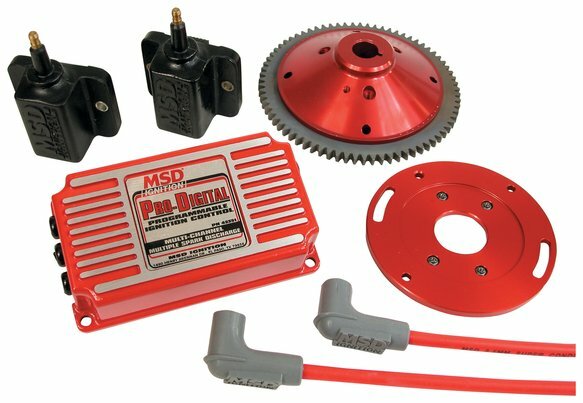 Fortunately, the Programmable MSD Ignition lets you tune in a custom timing curve to match your engine's requirements! The Multi-Channel Ignition lets you set an incredibly accurate timing curve throughout the rpm range of the engine. There are three settings that you program to create a timing curve. First you set where you want the initial timing, or idle timing. Next you set the rpm point to begin the curve followed by the amount you want it to retard (up to 30°) through the high rpm limit. All of the adjustments are made with dip switches built into the ignition. Rev Control The MSD's adjustable rev limiter allows you to program an rpm limit that the engine will not rev past. This is a great feature that will save your engine from overrev damage caused by parts failure or if the craft's drive mechanism comes out of the water. When your limit is reached, the ignition adjusts the spark output quickly to stay below that rpm. This produces a smooth rev limiting action. Holeshot Thanks to the rev limiting circuit of the Ignition, MSD engineers developed a feature that will give you great holeshots. By installing a handlebar operated switch, you can activate a lower rpm limit that will hold the engine under 3,000 rpm. This way you can hold the throttle wide open and concentrate on the rubberband snapping. When it does, you release the button, the engine revs to full power and you launch out in front! Adjustable Timing Curve Adjustable Rev Limiter Built in Holeshot feature Start retard or delay to ease starting Easy Starts When you increase the compression ratio of your engine, it also puts more pressure on the starter to crank the engine over. The MSD Programmable Ignition has two features that can help ease this cranking pressure and improve the start up of your watercraft. Retard: When activated, this feature retards the timing 20° to ease cranking. When the engine starts, the timing returns to the initial setting. Delay for Electric Starters: When activated, this mode will not produce a spark for the first several rotations of the engine. This helps build momentum in the engine, making it easier to start.